We had just about given hope of seeing many more monarchs in Cape May Point this year, since we have seen very low numbers over the last week. Gentle northwest winds on Tuesday brought a modest increase in monarch numbers, to our surprise, and it seemed like numbers were increasing throughout the day. While the seaside goldenrod is still blooming along the upper beach, the monarchs were not found there. 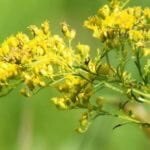 Maybe it was the wind — the beach is always the breeziest spot — or maybe the goldenrod isn’t offering much nectar. 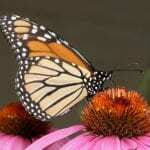 Thankfully there are many active gardens around Cape May Point that are still filled with nectar-rich flowers, and that’s where the monarchs were found. As a team we tagged nearly 100 monarchs today. 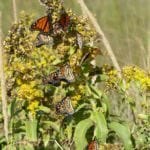 We don’t know what’s going to happen over the next few days, but the weather is supposed to stay fairly mild, so one more late surge of migrating monarchs may be possible. We were also surprised today by good numbers of other butterflies. We saw a sudden upsurge of Red Admirals, including the one shown above, and there were several other species found in the gardens around Cape May Point. The fresh Question Mark, shown below, was certainly one of the most beautiful.